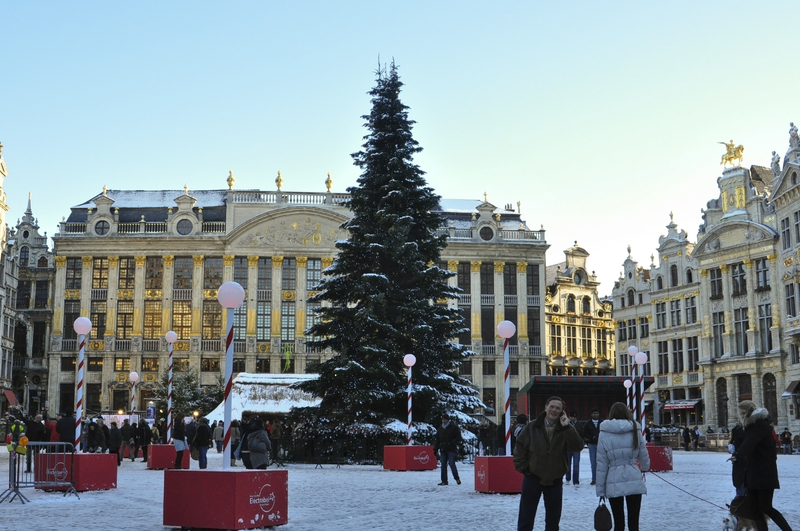 Brussels, a pretty city with a strong French influence, was our second stop on our Christmas holiday. We arrived in Brussels in mid-afternoon terribly hungry. 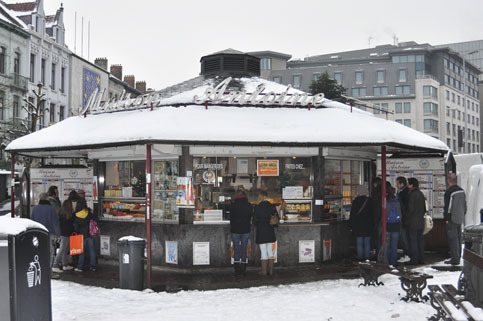 We asked the hotel concierge for a recommendation for mussels or fries (traditional Belgium fare) and she told us that Maison Antoine, the small take-away spot directly in front of our hotel, was continuously rated as the best French fry spot in Brussels. Off we went to taste for ourselves. The fries, wrapped in paper rolled in a cone shape, were lightly browned and crisped to perfection. Hunger problem solved. Yes, we did eat french fries for lunch, but they were the best fries we’ve had in a long time. We walked around the snow-covered sidewalks and made our way to La Grand Place, the main square in Brussels. Here we admired the giant Christmas tree, nativity scene and all the beautiful buildings that surround the square (see photo above). We wandered through St. Catherine’s Christmas Market (our second Christmas Market of the trip) and enjoyed our first mulled wine (warmed spiced red wine), which raised our body temperatures to a more comfortable level. The Musée Magritte Museum was the one museum we visited while in Brussels. The museum, in the heart of Brussels at Place Royale, has over 200 works of the Belgium surrealist painter, Rene Magritte. Neither Kevin nor I knew much about Magritte’s art before our visit so we were amazed by his pure talent. 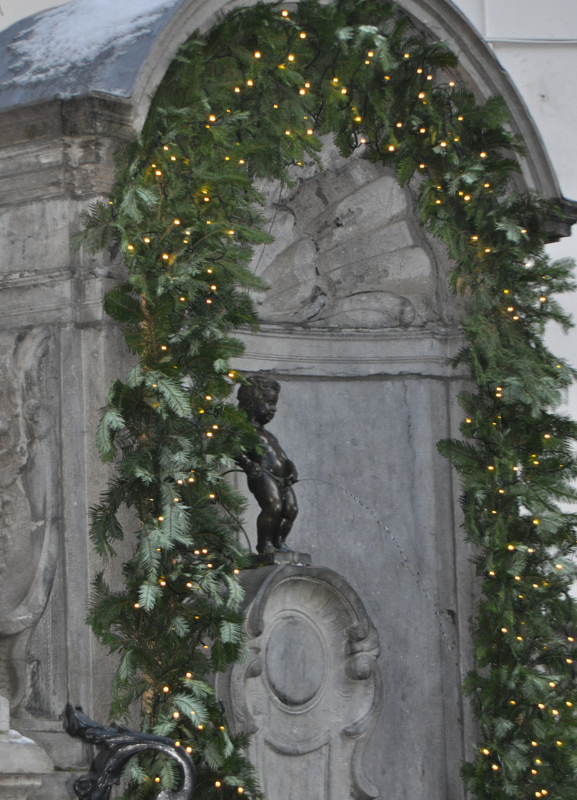 We also went to see the Manneken-Pis, the famous small statue of a little boy urinating, which dates back to the early 1600s. There are many stories, or legends, about the statue on the internet so I will not get into it here. It’s all too much especially when I found out they dress him in different costumes several times a year. Do a search and you’ll see what I mean. The French fries as described above.